So earlier tonight, the awesome posemaker Adorkable Peapod offered a challenge to the bloggers. Blog something that is out of your norm! Like if you always blog high editorial fashion, blog yourself in jeans and a tshirt. Or if you do lovely girly looks, go crazy sci-fi or grungy. This sounded like fun to me! But what in the world would I do?? So I ran to the one place I knew would have some fantastic costumes – BARE ROSE!! I could not stop looking at everything because I haven’t been there in so long. I just love what I picked out!! This is the Brass Armor Lady. I am glad I lift weights because this is some heavy armor!! But it’s SO COOL. I guess this would be considered steampunk maybe? I’m so bad at knowing all the different things. But I’ve got goggles and there are grenades on the back of my belt with little propellors. I think they’re grenades. I’m actually not sure! EVERYTHING is included in this outfit, even the boots, and it’s less than $200L. Oh Bare Rose, how much I love you! Thank you, Adorkable, for pushing us into something a little different! This was SO MUCH FUN for me! I want more costumes now! I hope all of you choose to take on this challenge! I’ll admit it. I’m in love. Just the very sight of my love makes me go soft and fuzzy hearted. I want to cuddle up with my love and just sit in bliss. I look forward to Valentine’s Day because it means I’m surrounded in my love. I’m talking about the color pink, of course. What did you think I meant? If you head on over to G Field, there’s a little hunt going on! Six items are free, such as this Heart Bag I’m carrying. There’s one in red, too! The Heart Flats are in the hunt, but are $30L, and there are two pairs to find. There are also two items for $50L each in the hunt, and honey, let me tell you. You WANT to find them. But if you’re busy, you can buy all 10 hunt items for $200L at the front of the store. Thank you, Cerberus!! I have to go roll around in more pink goodness now. God, I love Valentine’s Day. I’ll admit it. I’m a sucker for anything I can ride on in SL. Don’t get dirty! Cars, horses, pogo balls, bicycles…if I can ride it, I’m happy! I saw last night that Blackberry Jam was having a 50% off sale, and that it included their Kiddy Wheels cars, so I ran right out today and grabbed it!! Aww, Piper thinks my driving skills need work. The Kiddy Wheels is a car that you wear, so if it’s just you in the car, then you can vroom vroom anywhere you’d like to go! I always like that because sometimes I want to drive around in a place where I can’t rez something. Now you CAN, however, buy a separate “saddle” for your car if you want 3 of your friends to ride with you. The saddle you DO have to rez to the ground. Then you sit on the invisible box [ctrl-alt-t to turn on your “Reds” so you can see it!] and your passengers can sit on the poseballs. Then…vroom vroom! But don’t worry, this isn’t just for girls. In the pack there is a boy car too! 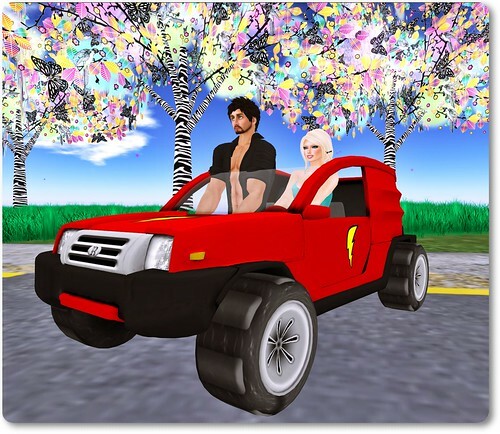 Along with both the male & female cars in the pack, there are different sizes for adult and child sized avatars. Currently during the sale, they’re available for $199L, and you can purchase the saddle for $50L. 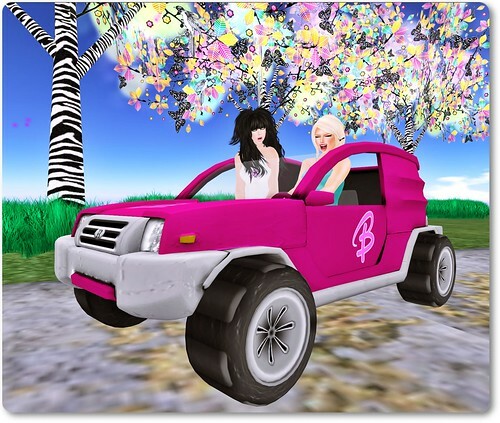 Vroom vroom yourself over to Blackberry Jam and get rollin’! Hey, have you heard of the store CLICK before? No? Oh my gosh, why not?? Collaborating with some of the best posers on the grid, creator Flix Saiman makes some unbelievable photosets! These things are simply AMAZING. And guess what? 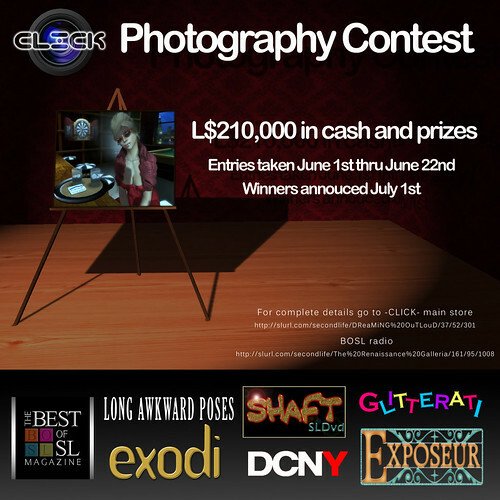 CLICK is having a contest!! Here are some of the important details! 2. Photos must be done in high resolution (exception is the Most Natural title. These will be accepted as snapshots ONLY to ensure no post-processing has been done). Photos should be perfectly square sized as a 1024×1024. 5. Photos for the Most Popular prize will be sorted and a max of 100 will be displayed for popular vote at The Renaissance Galleria. I won’t get into all the prizes, but the first place winner? $10,000L, baby! Plus loads of gift cards, skins and clothes from places like Glitterati, Exposeur, Exodi, and more! In total, it’s worth over $46,000L!! Head over to CLICK to pick up more information on the contest, and to get your posesets so you can take part in this wonderful contest!